Saturday's game mercifully ended early, getting called off in the top of the ninth inning due to rain. Portland's pitching fell apart early, as Carson Smith, who was making a rehab appearance, managed to record just one out while allowing two runs on three walks and a pair of sacrifice flies. Trey Ball was similarly shaky out of the bullpen as he was tagged for six runs on 12 hits and three walks in just four innings of work. Danny Mars was the offensive standout, going 4 for 5 while launching his sixth home run of the year. Cole Sturgeon and Josh Ockimey also homered, marking Ockimey's second round-tripper in four games for Portland. Mike Olt and Deiner Lopez were the only Sea Dogs who were held hitless. The offense failed to back up a decent effort from Matthew Kent, as the Red Sox fell to the Pelicans. Kent went seven innings, surrendering all four Pelican runs on eight hits, three of which were home runs, though he did punch out seven batters. Matthew Gorst pitched a scoreless ninth. Mike Meyers went 2 for 3 with a double. Jordan Betts and Austin Rei each were 1 for 3 with a double and a run scored. Bryan Mata was saddled with the loss, even though the RiverDogs did most of their damage off of his replacement, Jared Oliver. Mata went four innings and gave up four runs on four hits and two walks. Oliver, meanwhile, was knocked around for six runs on two hits and five walks in just one inning of work. After Juan Florentino allowed two more runs in three innings, first baseman Tucker Tubbs threw the team's lone scoreless inning. Isaias Lucena went 3 for 4, and both Jerry Downs and Bobby Dalbec recorded doubles as part of 1-for-3 efforts. Enmanuel De Jesus notched his third win of the season with 5 2/3 innings of two-run baseball. De Jesus allowed seven hits, walked two, and struck out four. Juan Barriento and Zach Sterry combined for four of the Spinners seven hits, each going 2 for 4. Frankie Rios managed only one hit but walked three times, and Nicholos Hamilton, despite being held hitless, worked two walks in the game. A rough day on the mound and a modest showing at the plate made for a lopsided loss for the GCL Red Sox. Three pitchers combined to give up 12 runs in six innings, with the lone bright spot coming out of the pen in the form of two shutout innings and four strikeouts from Tanner Raiburn. Pedro Castellanos, Everlouis Lozada, and David Durden each had two hits, and Castellanos scored two runs. Blake Swihart continued his rehab assignment and went 0 for 5. Willis Figueroa had two hits to raise his average to .367, but the bats were otherwise quiet, as the team collected four hits total in the shutout loss. Jeison Pena provided relief out of the pen by eating up 3 1/3 innings without allowing a run, and Alberto Franco struck out two in his scoreless inning of work. Player of the Night: In a day of losses, Danny Mars did all he could by collecting four hits including a home run. The big day raises his average to .313 on the year. 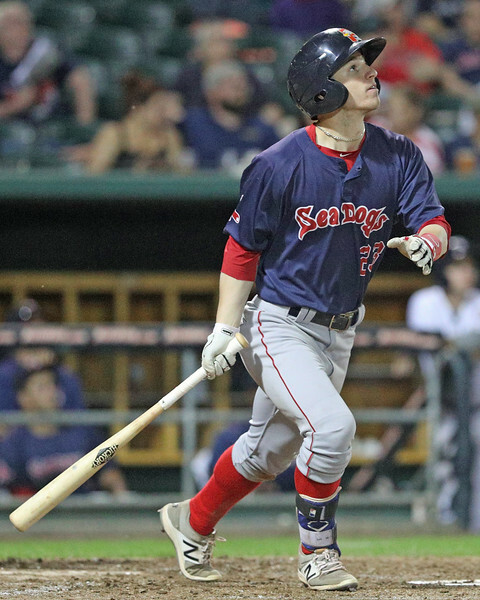 The 23-year-old left fielder performed well as the leadoff hitter for Portland on Saturday, and his high average combined with a solid .360 OBP may give him more opportunities to hit atop a powerful Sea Dogs lineup.